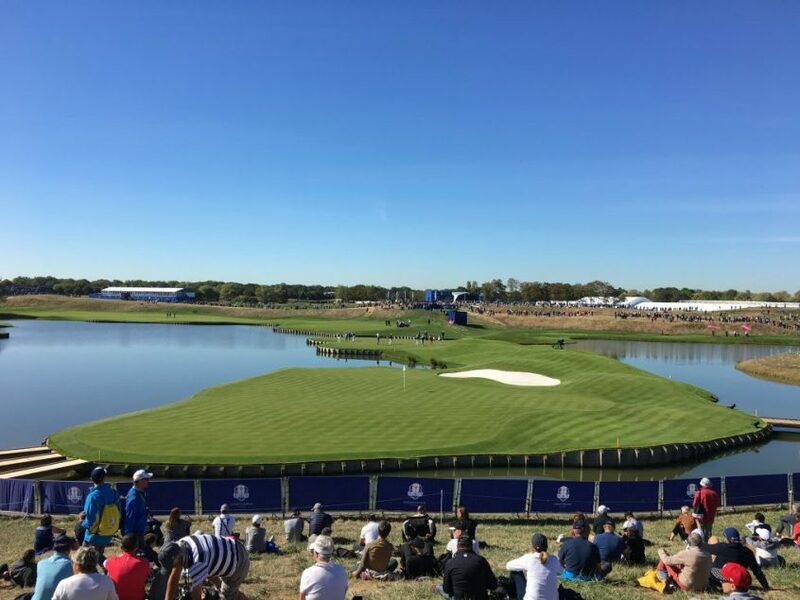 The day was glorious and my very much anticipated visit to the Ryder Cup at Golf National near Versailles, was as fun as expected. 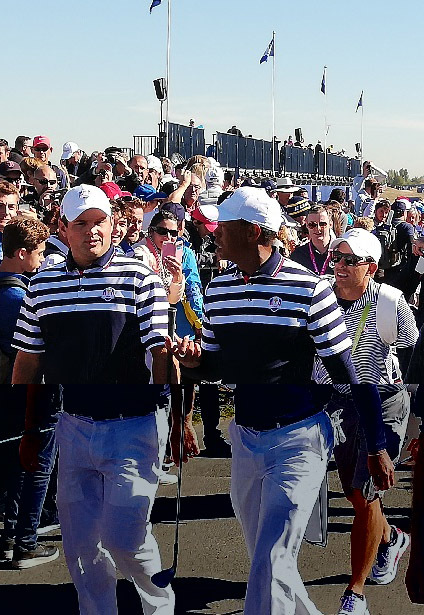 The preparation has been ten years in the making for Pascal Grizot who, as vice president of the French Golf Federation, was daring enough to think that a country with only 400 000 golfers, could organize the greatest golf team event in the world. And he was right. 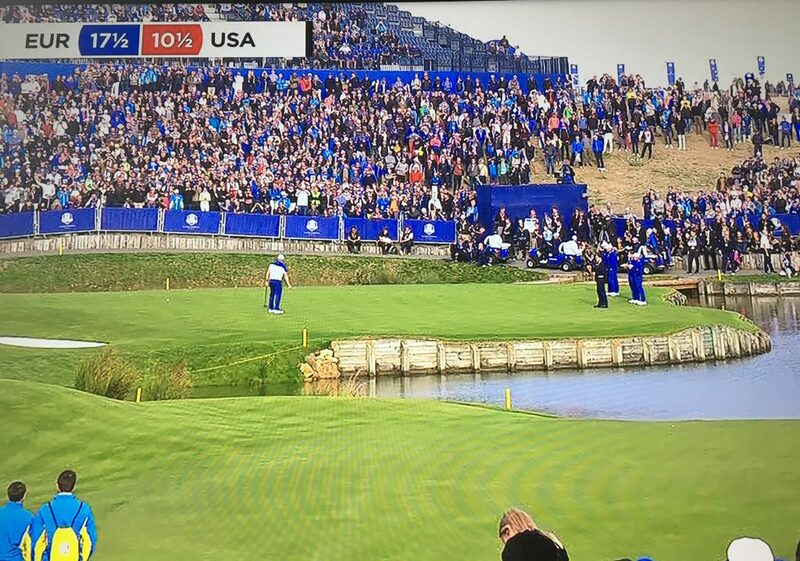 More than 60 000 spectators a day was the record attendance for the Ryder cup and Team Europe won with 17,5 victories agains 10,5 for the Americans. All were exceptional players. I booked my tickets a year ago and went with three lovely friends on the RER to St Quentin en Yvelines, a suburban industrial town. Everything was smooth in the organisation and I discussed with three ladies gendarmes who had never been on a golf course and suggested they start the game! The security was huge but charming. As always, it was hard to get near the players but I got lucky on the 12 th hole when Phil Mickelson drove into the rough ten meters from where I stood. He played the green from there in a smashing 230 m shot! Tiger had the longest drive on that hole and played well but never smiled. Their casualness at putting and playing in general was a lovely sight. You had the feeling that they were just a bunch of kids enjoying their game. It was practice day of course! I spoke to Americans who had come from Florida and others from North Carolina, young British kids from London. A lady champion from Australia came especially as did many Italians, Danes and Swedes, Spaniards and Brits. The atmosphere in the stands was fun and the constant shining sun was of course another miracle. All the food catering and shops were managed by Brits and English was the only language spoken. It suddenly felt like we had travelled far from Paris. But on Friday and Saturday the story was different. While the American players seemed to be the favorites before, a “couple” emerged who proved to be unbeatable on the European side: Italian player Francesco Molinari (who won the British Open this year) and the Brit Tommy Fleetwood, 27, (winner of the French Open on this course last year), won their four matches together in foursome and four balls. 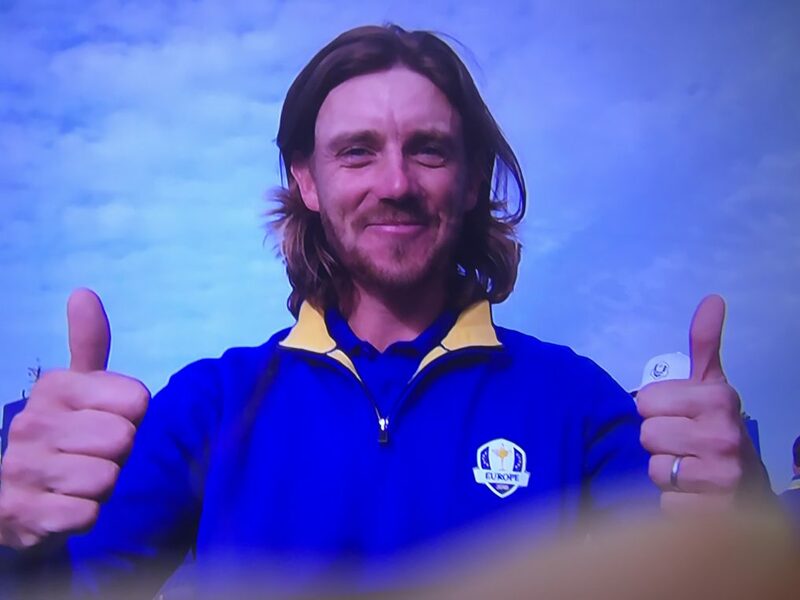 And Fleetwood who was in the Ryder cup for the first time emerged as the most cheered “kid” of the day on Sunday. Their consistency was psychologically important especially on Friday when the US players were ahead. 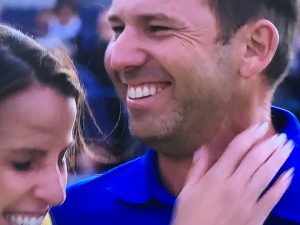 The other huge surprise was Sergio Garcia, the Spaniard, who had not played well all season. With his victory on Fowler on Sunday, he became the most victorious Ryder cup player ever with 27, 5 wins beating Nic Faldo who had 27. He was also proof that experience is valuable to assist the young players and the teams were very well chosen. The captain Thomas Björn was Danish, as was Thorbjorn Olesen, two players were Swedish, two were Spanish, one Italian, five British and one from Northern Ireland. There were sadly no French nor German players but this incredible twelve player group was very European and seemed to be so protective of one another and so close in the fight, that some commentators said that their spirit had won over an American team which was less united. Another element that mattered is that most European players knew the course well while the Americans had never played it before, not having bothered to play the French Open last June. Yet it would be unfair not to mention the exceptional game of Jordan Spieth who holed more putts than anyone, of Tony Finau, Dustin Johnson and Phil Mickelson. They gave us fabulous emotions. 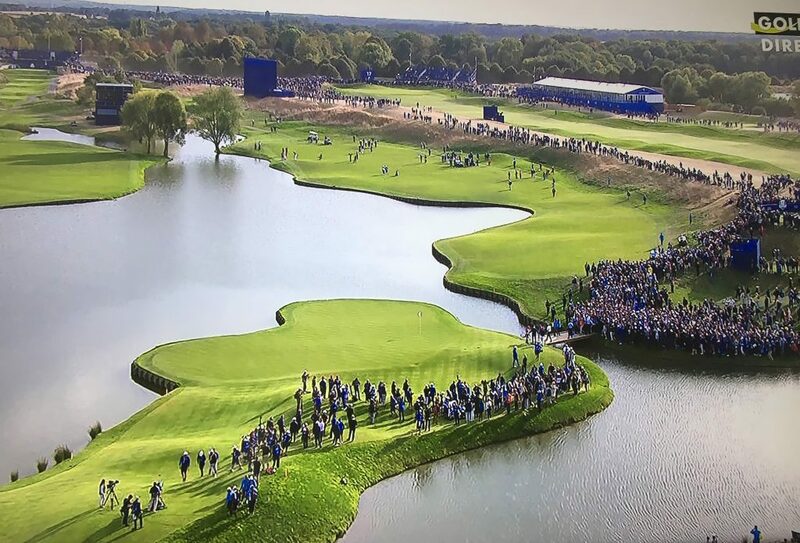 The Golf National proved to be beautiful to look at, perfectly manicured thanks to the 150 gardeners including many volunteers. It was incredibly hard to play with all the water hazards which often changed the course of the game in match play, including the loss of Phil Mickelson on Sunday, on the 16 th hole. Poulter and Molinari (who won his five games) were surprise stars on Sunday and Jon Rahm, the youngest player at 23, had the guts to beat Tiger Woods two and one. The show in full blue skies was absolutely fabulous and the emotion created by these young men hugging and kissing each other was overwhelming. They all seemed to enjoy themselves so much and not playing for money but just for the win, probably made the difference. 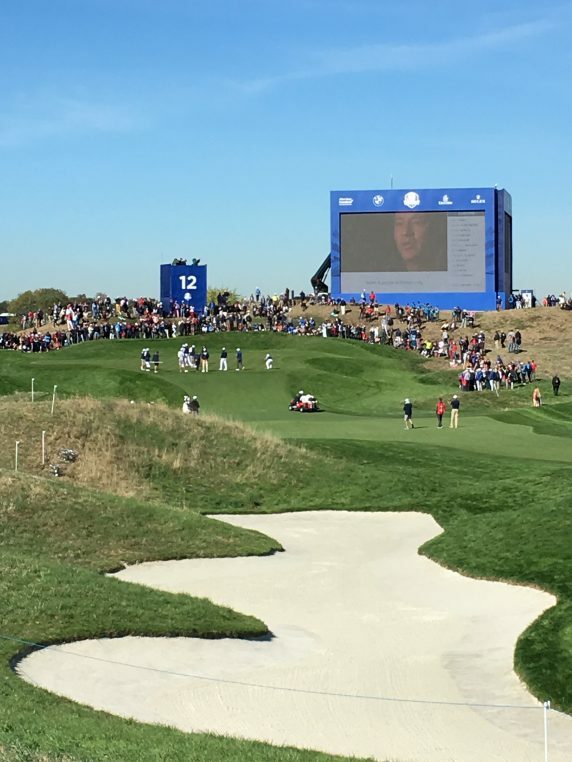 The contradiction between the beauty of Golf National and the lack of French players was almost forgotten. Forty percent of attendance was French anyway. Many young children and local pros had made the trip from all over the country. All players seemed happy with their French week, the great dinner hosted by Rolex at Versailles on Wednesday night and the lovely nights at Trianon Palace hotel. Pascal Grizot, who conceived this crazy project ten years ago was awarded the Legion of honor last week. His wife Naïla can now breathe again. The very long and arduous adventure is a success. The next Ryder Cup will be in Whistling Straits, Wisconsin in September 2020. And then back to Europe at the Marco Simone golf club in Rome. The Ryder, stronger than Brexit! to describe what went on at Golf National this week end . Definitely the beginning of a new era for golf in France as souvenirs will remain for ever . Many thanks to Pascal Grizot who had the guts to trigger this adventure and turn it into a fabulous success and to you Laure for having inevitably mentioned it on the first page of your blog this week. Thank you Laure for this intimate account of this world-class event. I could see the moments that you described. I love your account, Laure: like watching a perfect Ryder drive! I was looking out for you because I imagined you MUST be there. 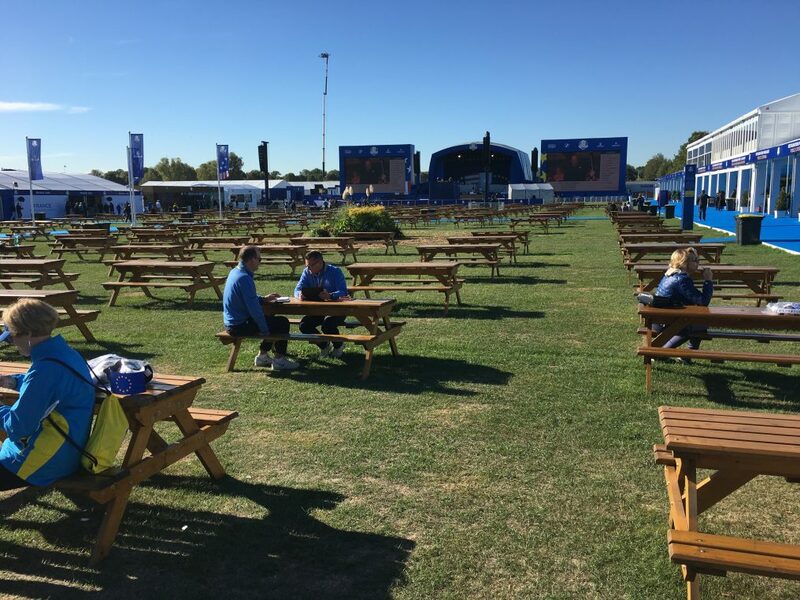 What a wonderful Ryder Cup it was. We were all glued. Your report perfectly sums up the wonderful weekend! Thank you for sharing and yes, I noticed that Tiger Woods just didn’t seem very happy at all throughout the tournament. Maybe his back is still incredibly painful and he was being brave. I was so happy to read your wonderful account of the Ryder Cup. You brought it close. 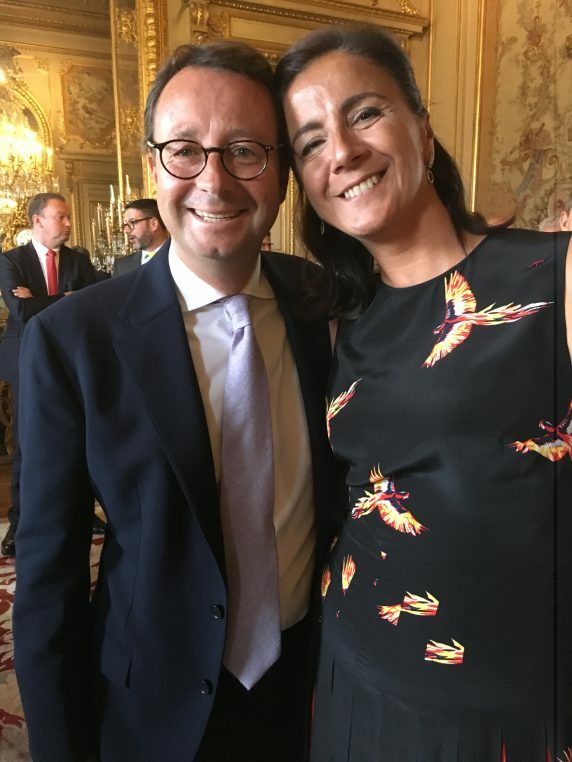 Dear Laure–Ed and I were thinking of you as we watched, just KNOWING you were there! You add vivid sports coverage to your long list of talents! 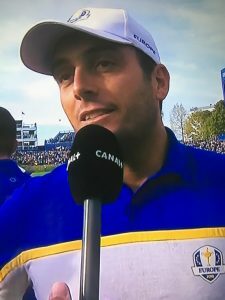 It sounds like an amazing tournament, and one can assume that several young French who saw the Ryder Cup competition will become the next generations’s leading players. Stay tuned for a French champion in the future!